In August 2017, the Southern Environmental Law Center, on behalf of Audubon North Carolina, challenged the Corps’ approval of the terminal groin in court. Read more. The Army Corps of Engineers approved Ocean Isle Beach’s terminal groin on Feb. 27, 2017, and the town received a federal permit for the project that same day. Town officials expect construction to begin in November. There are some special permit conditions, including one that puts a moratorium on construction between April 1 and Nov. 15 to protect fish, birds and other protected species during seasonal migration. Read more here. The Town of Ocean Isle Beach has proposed to build an expensive 750-foot terminal groin at Shallotte Inlet as a way to control erosion. The North Carolina Coastal Federation advocates for less expensive and gentler methods to decrease erosion. The application for this terminal groin has already been problematic because a Section 7 review was not included in the draft Environmental Impact Statement. A Section 7 review, as required by the federal Endangered Species Act, is typically conducted by the U.S. Fish and Wildlife Service in coordination with the draft EIS. The draft EIS and final EIS also both failed to thoroughly evaluate all five options — called alternatives — equally. The Corps selected Alternative 5 (the terminal groin) as the preferred option, even though Alternative 4 (channel realignment) would also decrease erosion. Channel realignment is less damaging to habitat and is less expensive than a terminal groin. 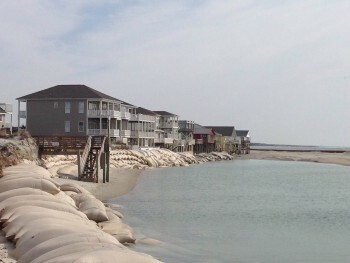 Damage and erosion: A terminal groin at the east end of the island could impose navigational hazards and influence, in a negative manner, the beach on the other side of the inlet at the west end of Holden Beach. Critical habitat: The proposed terminal groin could degrade or destroy critical habitat for fish and wildlife. The U.S. Fish and Wildlife expressed its opinion when this project was first planned in 2012, stating that it would not approve the project because it would significantly damage the critical habitat of piping plover and adversely affect sea turtles, sea beach amaranth and several estuarine-dependent marine species. Public access and recreation: Because of the way terminal groins unnaturally affect beaches, this project would risk the quality of public beach access at the east end of Ocean Isle Beach. This terminal groin, if built, would cost taxpayers at least $45.8 million over 30 years, but it would only protect less than two-dozen oceanfront properties with a tax value of less than $7.5 million. It may also make other undeveloped parcels of land near the inlet more valuable to develop. Taxpayers will pay for designing, permitting, building and maintaining the groin — and the town will become legally and financially responsible if the groin causes damage to either private or publicly owned properties in the future. Read the comment letter on the draft EIS study from the North Carolina Coastal Federation (March 2015). Read the comment letter on the draft EIS study from the U.S. Fish and Wildlife Service (March 2015). Read the comment letter on the final EIS from the federation (May 2016). Read the comment letter on the final EIS from the Southern Environmental Law Center (May 2016). Read the comment letter on the final EIS from Audubon North Carolina (May 2016). Read the comment letter on the final EIS from the U.S. Fish and Wildlife Service (May 2016). Read the Southern Environmental Law Center’s comment letter on the Ocean Isle Beach terminal groin application (July 2016). Questions? Contact Ana Zivanovic-Nenadovic, senior policy analyst.